It’s possible that I’m the only person on the planet who hasn’t done this much until recently, but just in case some of you are in the dark, I’m going to share. I’m not an enormous fan of plug-in air freshening devices, mainly because they aren’t free and because they do create some unnecessary trash. It’s not that I visit someone’s house and recoil in horror when I see a plug-in, it’s just that I can’t usually bring myself to buy any for my own home. I do like scented candles, but of course, the ones with non-cheesy scents* don’t come cheap. *I’m sure you know the ones…the fruit-scented candles that smell like children’s lip gloss, and the pine-scented candles that make your house smell like Pine-Sol. Even if you don’t normally use air-fresheners, if you’ve made fish for lunch and are then having people over to your house, you might be desperate for some sort of air-freshener. If you, like me, appreciate a spice/orange scented smell, this will fill the bill for you. It’s super easy, and as a bonus, it squeezes a little more use out of something that’s headed to the compost. All you need is citrus peels (I’ve used orange, clementine, and tangerine with no discernible difference in the aroma), cinnamon stocks, and whole cloves. Just deposit them in a pot (I like to break my cinnamon stick first), add enough water to cover the ingredients, and bring it all to a low simmer. 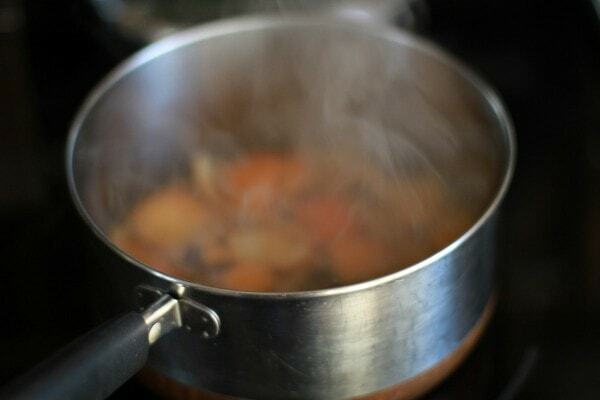 Once you’ve brought the water to a simmer, you can turn your burner down to a very low heat setting, and you’ll still get a lovely scent. It smells a lot like Russian tea to me…orangey and spicy. 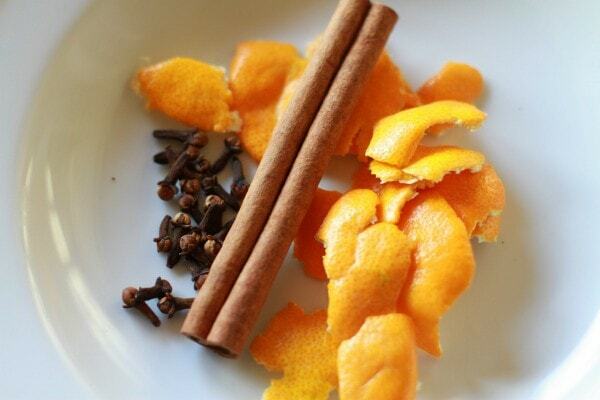 Once you’re done using the orange peels and spices, you can drain the water and put the solids in your compost pile. No waste! As far as ingredients go, the orange peels are free, assuming you eat oranges in the winter. The cloves and cinnamon can be more pricey, but check your grocery store to see if they have an ethnic foods or bulk foods section. Weis has an international foods aisle, and I can buy all sorts of spices there for far less than in the regular spice aisle. You can keep an eye out at this time of year for sales on whole spices as well, since they’re considered to be a holiday ingredient. You can also save your cinnamon stick and cloves to use in the next batch, as I highly doubt they exhaust their entire aromatic capabilities in just one day. Now that I’ve written this post, I’m wondering if there are any other good spice/peel combinations. If you know of one, leave a comment! Today’s 365 post: Curling ribbon is harder than it looks. Joshua’s 365 post: Joshua didn’t get a post up, so I’m hijacking his blog today. I have heard, not yet tried, that putting a cinnamon stick into your vacuum bag is a good air freshener. I think I will give that a shot today since I have to vacuum anyways. Me too! I sometimes purposely put a new bag in the vacuum after we take our tree out…I vacuum up all the needles, and it makes the vacuum smell lovely until we need a new bag. I do this frequently! It also humidifies the air in your home a little bit. The cinnamon stick can be used at least 3 times for this purpose and continues to provide a good smell. This is also a good use for a moldy piece of citrus, if you find one hiding in the fridge. Just cut off the mold and throw the remainder of the fruit into the simmering water. Another nice smell is created with lemon peel and a mint-tea teabag or lemon peel and a spring of rosemary. If you like a pine smell, you can use a piece of your Christmas tree! I recently heard of someone throwing orange peels and cinnamon stick in their wood burning fireplace, saying that it gave a nice spiced tea scent. Sadly, I have gas logs so I can’t try it, but it sounds great! Also, if you find a really cheap crock-pot at Goodwill, you can put ingredients in it and leave on all day without watching your stove. Not only does this method of air freshening generate no waste, it is also chemical-free. The plug-in air fresheners are pumping chemicals into the air that we end up breathing. Yeah for all natural! I once put cinnamon on a baking pan and turned the oven on low when I had invited friends over for Christmas cookies. As soon as they walked in they said, “It smells like cookies!” Of course, running your oven for very long isn’t very frugal! Sadly, due to sinus problems I’m almost completely without a sense of smell these days. I’m praying it will come back. I had a fire in my toaster over a few months ago that I didn’t even smell before I saw it! Who knew a sense of smell was a safety issue! P.S. I appreciate non-synthetic smells as even if I can’t smell them, I’m allergic to the artifically scented candles, room fresheners, etc. I went to a dinner party on Saturday. As the night went on I became more and more congested to the point I could hardly breathe. I figured at least one pine scented jar candle was to blame. Turns out when I politely asked if we could extinguish this one candle they admitted that there were five pine scented candles burning (two in sconces on either side my head over the table) and one pine scented plug in. We need to keep in mind that these are chemicals. My friends were nice about it and after opening a window and blowing everything out, I felt a lot better. I do like the smelly candles, especially the ones with great Christmas smells. Will have to give this a try too! I have done the cinnamon stick and cloves on top of our kerosene heater but I’ve never added orange peels. Will have to try that now! I do have a strange question though. We are in central Maryland, and I shop at Weis too. I noticed just last week that there are so many cheaper spices in the international aisle! But, I admit, I wondered about their quality since they are so much cheaper? Do you know what the difference is, if any? Or why they are so much less expensive? I have no idea why they’re so much cheaper, but thus far, I have not noticed a difference in quality. Bulk spices at “international” or “ethnic” stores, or even that section at a mainstream supermarket, are mind-bogglingly lower-priced than the ones in the little red-topped jars. Even salt is cheaper. Oh, and saffron! $19 for a tiny jar vs. a couple of bucks for more than enough! We have used these products with no discernable difference in quality. I think there are a couple of things at play. 1) advertising and store placement costs–has been discussed plenty on this blog. 2) processing and transportation–bulk product in a cellophane envelope just costs less to pack and move around than tiny amounts in a tiny jar with a lid and 2 different seals. 3) the price the customer is willing to pay is always involved in a non-commodity product like this. The typical customer for these brands or at the specialty supermarket is usually not in the market for something at a premium price point. We started doing this at our house a few years ago when I finally organized my spice cabinet and realized we had 3 tins of pumpkin pie spice….. and they were all older than the kids. LOL. Instead of just throwing them out my mom suggested simmering the spices on the stove in some water. Smelled wonderful! My mom has done this since I was a kid, and whenever I have orange peels around I do it, too. You can also do it with apple peels, though it isn’t as strongly-scented, or some crushed cranberries. My mom always just used orange peels, so if you only have those, you can definitely use that. And that would be SUPER cheap. I love anything lemon so I often mix juniper berries and lemon peel on the stove. Makes me feel that everything is clean. My friend was just remarking that her baking spices are too old to use. Now she’ll have a use for them. 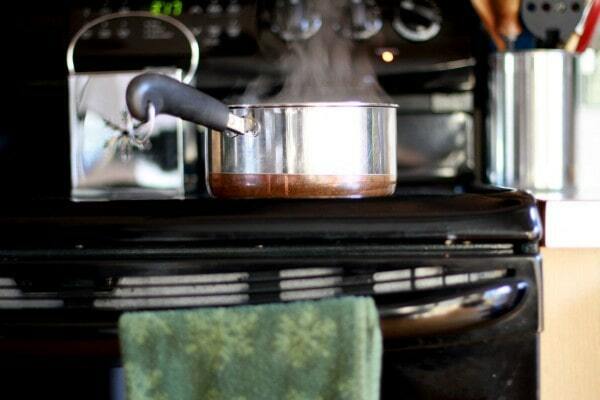 Many realtors recommend simmering applesauce or apple cider before an open house or showing, for just this reason. I guess they’re assuming one adds cinnamon. On a related note, if one wants to guerilla-advertize a BBQ or meat sampling, throw a sliced onion on the grill. That smell is also amazing. I baked cookies before we showed our house! Nice and homey smelling. i frequently buy whole cardamom pods for tea , to boil with the water for Arabic style hot tea. I love the smell, but deff buy the pods in bulk from an ethnic store or other source, the little bottles of pre ground spice in the spice isle are 10 times the price. And I do this so often, but don’t want to leave hot stuff on the stove unattended with cognitively challenged kids at home, so I am searching Goodwill for a little 3 cup mini crockpot to use instead. I am exactly the same…. Those chemical-y plug-ins give me headaches, but I like a pretty, subtle scent at my place. The orange peel and cinnamon sticks boiling smell like Christmas! So nice. I did this a few days ago with lemon peels, cinnamon, and cloves using old spices from my spice cabinet. Smelled great. However, I don’t know if anyone else has had this problem, but my pot still had a little of the smell in it after I washed it. It had a nonstick coating, so that might had absorbed it. So, if you have choice, I wouldn’t use a pot with a nonstick coating. That’s good to know. I’ve only done it in my stainless steel pot, and of course that doesn’t absorb odors. You can also use whole apples or oranges (I’d imagine any fruit would work) that is past the point of being able to eat but not moldy. Also, ground cinnamon works just as well (maybe even better) than the sticks, and it’s WAY more frugal. I was so expecting to see a photo of an open window then realised it must be pretty cold where you are! Oh, I’m a big fan of an open window when the air isn’t cold (or hot). But at this time of year, opening the window isn’t a very frugal thing to do! I love this idea and will try it tonight! I’m pretty picky about the things that I smell (telling me “here, smell this” is a sure-fire way to get me to back away from you, and I rarely smell perfumes in stores). I also can’t stand scented candles and plug-ins because they never smell “real” and they give me allergies. 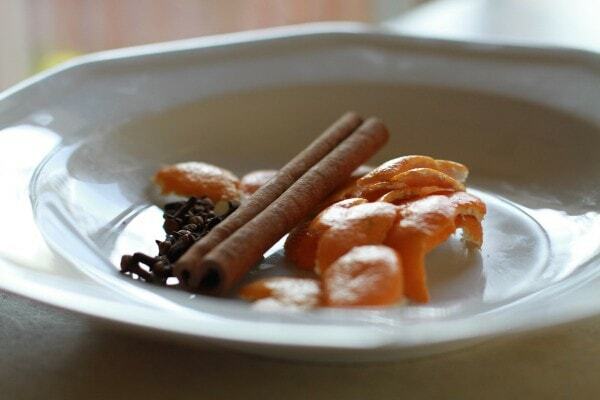 Simmering orange peels and cinnamon sticks is a “real” smell, and not an artificial reproduction-sounds delicious! We do this, but only use cinnamon sticks. I’ll have to try a bit of lemon peel and a mint tea bag, that sounds like a delicious scent, and we have ton of green tea mint teabags right now. I like freshening the air with apples and cinnamon especially, but Lemon balm, lemon grass or mint leaves do a nice job too and to make things even better, it makes a nice natural herbal tea. That way you waste even less! And yes, the cinnamon sticks and cloves can be used over and over and still smell great. I have done this with any citrus rinds (orange in the winter, grapefruit or lemon in the spring) also apples and pears, the rinds are not as fragrant as pieces/chunks of fruit. I also have used tea bags, as mentioned by someone else. Tea bags for strongly sented herbal teas work great as well. You can even add spices of citrus to them. My old boyfriends Mom used to throw a cast iron pot filled onto their wood burning stove to help humidify the air and make it smell nice. i have that simmering on my stove right now!!! love it!! re: Candles. Glade has a promotion at Target. If you buy 5 glade products( I bought all candles), you get a 5.00 gift card. They are on sale for 2.50 each. There are Always coupons availble too. I got 5 candles for a total of 4.75. Not too bad and those candles are highly scented and last a long time. They have some great xmas scents too. Another idea that I have used is placing an apple peel near the flame of a large candle. The apple peel will brown and make the house smell of apple pie. Of course, you have to watch it while it’s burning so it doesn’t catch fire. This makes me think of my mom! At Christmas time, she’d always boil cinnamon sticks in a little pot on the back burner of the stove. Whenever I make apple pie, I do something similar with the peels and cores. You can also add candied ginger! Of course, when you’ve made an apple pie, it’s hardly possible for your home to smell bad. love this! I can smell it now! Thanks for the reminder! I love doing this. Sometimes I find imitation extracts on sale for $1.00 (usually vanilla or almond) and they are a nice addition. I bought a few of those plug-in air fresheners, until one time I pulled it out and put in on my side table because it was too strong smelling. It tipped over and some of the fluid leaked out and it COMPLETELY stripped the finish on my table (where the liquid contacted) down to the bare wood (and this was a commercially finished table!). I figured if it could do that to wood finish, what in the world was it doing to our lungs? I threw them all out immediately. I’ve also heard that plug-ins have been known to cause house fires – not sure if it’s true, but I don’t want to test it! I put an orange, a lemon, a few cinnamon sticks, some cloves, and a little nutmeg (from an old spice rack I bought at a yard sale) into bags with a note to simmer on the stove for a holiday air freshener and gave them as little christmas gifts to my coworkers on year. I also purchased some inexpensive vanilla extract thinking I had found a wonderful deal–it tasted TERRIBLE, but it made a nice addition to my simmering potpourri! Great idea for air freshening! I love reading your blog because of a lot of the natural things you come up with and do like this – great ways to reuse things! Had a thought for you – Have you even tried making your own distilled scented waters? Usually it involves a large stockpot, a smaller pan inside and simmering whatever you want the scent of, in the water in the pot and letting the distilled water run down into the smaller pan inside. You can add alcohol to help it “keep” longer or just refrigerate it and it should keep a few weeks and would be something to do with used fresh flowers and things like the orange peels and then you could have that bottle of water to spray last minute, it’d be natural and instead of running a crock or pan on the oven everytime you needed or wanted it, it could be there between times to use. I’m hurt! No one liked my idea of chicken soup? It is the greatest whether you are sick or if you just want your house to smell great, and inviting. I do this too. I’ll throw in apple peels and a spoon full of used coffee grounds. Makes the whole house smells good. Orange peels or squeezed limes or lemons in a bowl of water to steam your microwave is good to do. In a slow-cooker, combine fruit to preferences of smell. Cover in water. Top with bay leaves, whole cloves, and cinnamon sticks. Leave slow-cooker on low. We leave a pyrex simmering on the woodstove all winter. Moisture for the air and scents for the stale house. I only replace the peels and cinnamon every few weeks, or when the water isn’t replaced soon eonough and the whole mess has burnt to the bottom. I’m way behind the curve on this one, but I’m always looking for new “receipes” for smell-goods at home. One of my faves is sliced lemon (with a little bit of the peel zested in), vanilla extract, and a few sprigs of rosemary. simmered on low on the stove. smells amazing! Since it’s summer now, I make lots of fresh lemonade! I use the leftover lemon rinds, just throw then in the crockpot fill with water and let simmer on low all night. Sometimes I throw in strawberry tops, or old blueberries that are about to go bad. I also like lemon peel mixed with lavender oil. The possibilities are endless!